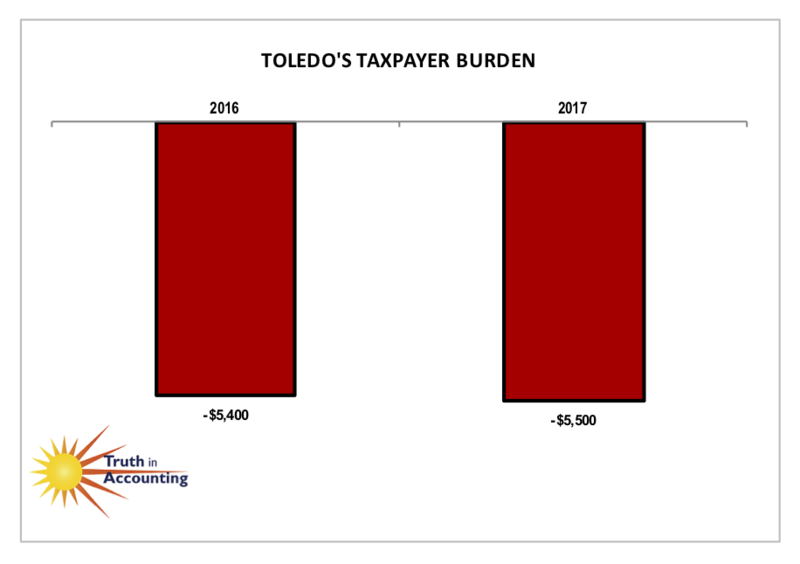 Toledo's Taxpayer Burden.™ is -$5,500, and received a "D" from TIA. 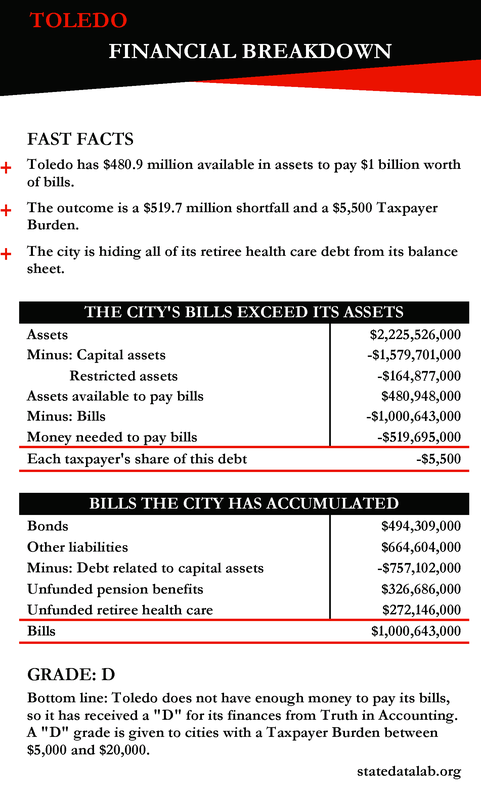 Toledo is a Sinkhole City without enough assets to cover its debt. Decisions by elected officials have created a Taxpayer Burden™, which is each taxpayer's share of city bills after its available assets have been tapped. TIA's Taxpayer Burden™ measurement incorporates all assets and liabilities, including retirement obligations. Toledo only has $480.9 million of assets available to pay bills totaling $1 billion. Because Toledo doesn't have enough money to pay its bills, it has a $519.7 million financial hole. 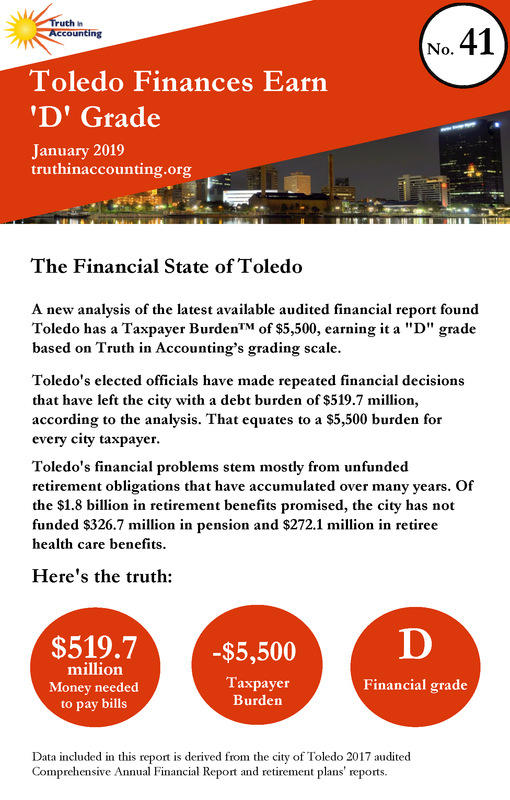 To erase this shortfall, each Toledo taxpayer would have to send $5,500 to the city. The city is hiding all of its retiree health care debt. A new accounting standard will be implemented in the 2018 fiscal year which will require governments to report this debt on the balance sheet. The city's financial report was released 179 days after its fiscal year end, which is considered timely according to the 180 day standard. Ohio got straight D grades across the board – statewide and its four most populous cities – for their lack of financial health, according to a recent report produced by the Chicago-based organization, Truth in Accounting (TIA).